American artist Winslow Homer (1836-1910) — the self-taught master best known today for his scenes of nature and the sea — got his start as one of the “special artists” of the Civil War. They were the combat correspondents of their day, traveling and living with soldiers. Their sketches, woodcuts, and paintings showed both the horror of battle and the makeshift respite of camp life. Printed by the thousands, these images gave the American public a visual sense of the war. Homer grew up in what was then rural Cambridge, and by 1859 had a studio on 10th Street in New York. In March 1861 he was hired by Harper’s Weekly to illustrate Abraham Lincoln’s first inaugural address — and then stayed on with the magazine when the Civil War began a month later. Off and on, Homer spent the next four years documenting the conflict. (For a time he was attached to the 5th New York Infantry, a unit known as Duryee’s Zouaves.) He sketched a war of action, color, and carnage — but he didn’t ignore the lulls in between, when soldiers lounged in camp thinking of home. Both are dated 1865, but could hardly be more different. 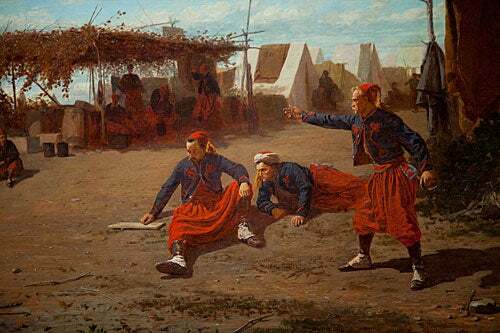 The first depicts Zouave soldiers — resplendent in their trademark red fezzes, short jackets, and billowing scarlet pants — pitching quoits in a crowded Army camp. (They were actually pitching horseshoes, said Renn.) The painting’s dramatic use of color marks it as a Homer, Renn said, and its composition shows both romantic and classical influences. In this detail, the dramatic use of color in “Pitching Quoits” marks it as a Homer, Renn said, and its composition shows both romantic and classical influences. It also shows, she added, “the presence of the absence” — a scene that speaks to a fact of life following the war. It was an immense killing field, with a death toll of 750,000. Murray helped develop the Engaging New Americans project at the Harvard Art Museums. It’s designed to introduce immigrants to American culture, and to show “how works of art really speak,” she said. “The Brush Harrow” is a frequent centerpiece of the classes. In his Civil War work, said Renn, Homer never depicted dead soldiers — a commonplace otherwise in newspapers of the time. Nor did Homer depict battle scenes as heroic. There is a touch of horror even in the outwardly peaceful “Pitching Quoits,” one viewer suggested this week. In the foreground, speckled on scrap wood near a dead campfire, are holly berries, tiny and blood-red. Upcoming, “Feininger in the Darkroom,” a two-point perspective gallery talk, Arthur M. Sackler Museum, 485 Broadway, Cambridge, from 3:30 to 4:30p.m., April 18. For additional information or upcoming talks, visit the website.